Treat yourself to a sonic massage with the monochord sound healing table. Allow the healing vibrations help soothe and release tension and stress and tune yourself up for the new year ahead. Press play on picture below to hear the monochord being played. The monochord is an ancient instrument invented by Pythagoras. He realised through exploring music ratios and harmonics that certain intervals in music had a profound and healing effect not just on humans, but certain ratios also governed the movement of planets. One such interval having healing properties is a perfect fifth which the monochord uses for healing. 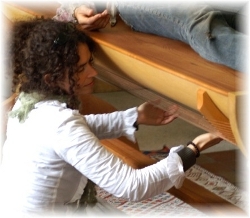 With the understanding of how vibration is the healing medicine of these times, clinical music therapist Joachim Marz developed the monochord as a sound healing table, 7ft long, 56 strings underneath half of which are tuned to C sharp and the other half tuned to G sharp (a perfect fifth). What makes this instrument extraordinary is that due to its flat top, you lie directly on top of the monochord. As the monochord is being played, the vibration goes directly into your body. Each cell starts to resonate with the healing harmonics of the monochord, helping the cells to come back into holistic resonance and optimum functioning as far as nature allows. It is like having a sonic massage. You are being bathed from head to toe in healing resonance. Strengthen your glandular and nervous system. Feel healthier, happier and whole. Release old blocks to help you move forward in your life. Follow up sessions: £50 or £45 concession. Brought to you from Heaven on Earth Music, creator of the celestial and popular albums: “108 Sacred Names of Mother Divine”, “Sacred Chants of Shiva” and “Sacred Chants of Buddha”. This is an album of vast expanse, deep relaxation and total immersion. 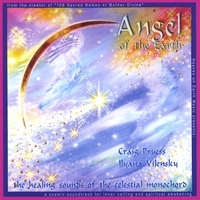 The music is ideal for healing, yoga, birthing and for relaxation. Using the 56 string MONOCHORD, a large wooden stringed instrument designed for sound healing (you lie on it! ), the harmonics and overtones of this remarkable instrument have a profound effect on the nervous and glandular system, the body, mind, emotions and soul. Craig Pruess, creator of the Sacred Chants series, and Preet Kaur (Ilyana Vilensky), Kundalini Yoga teacher and sound healer from Somerset, England, worked for over a year to capture these amazing sounds. Augmented on one track by Craig’s soft, soothing and lyrical sitar playing, along with tambura, bells and swaramandala, and graced by Preet’s solo shamanic singing style, the whole CD creates a sound bath – wave after wave washes over the listener. Native American Indian flute calls out on the second track, and the third track Ocean Prayer is a beautiful raga combining sitar, tambura, monochord, swaramandala along with Preet’s intoning and Craig’s deep Om chant. £12.95 + £1.50 P&P , UK distribution only!